Conquer the challenging road ahead from behind the wheel of a new Toyota. With a plethora of economical yet stylish vehicles to choose from, your options are endless at our Toyota dealership near Rochester, NY. Lease an eco-friendly Toyota Camry or Corolla sedan that can help you save at the pump, or finance a versatile Toyota RAV4 or Highlander SUV that’s perfect for the entire family. Unsure of whether a Toyota Tundra or Toyota Tacoma is right for you? Meet with a Toyota sales professional and ask about any of the Toyota lease and finance offers that we have available. 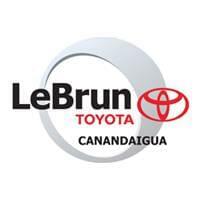 Peruse the new Toyota model showroom at LeBrun Toyota! Looking for ways to save when you purchase your next vehicle? Take a look at our Toyota Offers and New Car Specials to find deals you can’t resist. Contact us today to schedule a test drive or receive more information.